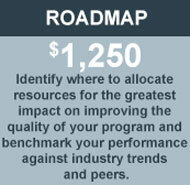 The following pricing plans are available for the MBA Lifecycle Survey Suite. Participating programs will choose one of these Decision Packages for each survey engaged. These packages are identical for all MBA Lifecycle Surveys (Entry, Midterm, Exit, and Alumni) with the exception of the Alumni Survey. 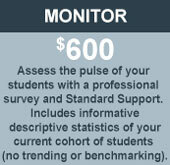 The Monitor Decision Package is not available for the Alumni Survey. Click on each row for a feature description or click here to show them all. End-user license agreement for limited use of copyright questionnaire template. Collect an unlimited number of responses (one response per student). Includes web survey fielding up to 3 weeks (2 survey invitations and student survey support). Survey extensions beyond 3 weeks available with advanced packages. Receive assistance via our Get Satisfaction social support community and self-service knowledge base. This community allows you to ask a question, share an idea, or report a problem. You can add up to 10 (open- or closed-ended questions) to the end of the standard questionnaire. Percept Research will assist you with designing the questions to collect actionable insight. It will take up to two weeks to complete the custom programming and associated quality assurance testing once the custom questions are finalized. Please keep this in mind when scheduling the survey start date. Data collected from customized questions will be presented as tables. Tabulation by manual double layer data entry of an unlimited number of completed print surveys. Means, minimums, maximums, standard deviation, and number of responses for each quantitative question. Raw (unedited) responses to open-ended questions with opt-in linkage to respondents. Time series data analysis of each quantitative question over three years to detect general patterns and project the future direction of this pattern. Graphical analysis of your program's key drivers of loyalty based on brand ratings and (derived or stated) importance to provide decision guides for translating respondent perceptions into strategic allocations of organizational investments. Benchmark comparisons to program type, size, and geographic region metrics. Benchmark comparisons to a composite of self-selected peer programs. A visual representation of verbatim responses to open-ended questions. These clouds give greater prominence to words that appear more frequently in the response text. Key findings and analyst commentary derived from your trended results compared to industry norms and your peers as well as your most recent Key Driver Analysis to provide an assessment on the branding and delivery of your program. A concise set of tables for all of the closed-ended questions in the survey. This summary only includes the data from most recent cohort and does not include the internal trends, Loyalty Index, Key Driver Analysis, industry benchmarks, or peer comparisons. This summary is designed to provide a quick snapshot of results from your most recent cohort of students - it is not intended to serve as a stand-alone report to drive continuous improvement. A summary of all verbatim responses in original format (no editing) for each open-ended question. If confidentiality waived by respondent, comments will be identified for potential follow-up for conflict resolution or marketing testimonial. A graphical display of your trended program results compared to standard industry segments and self-selected peer programs including high-level commentary and all metrics charted for comparative assessment. 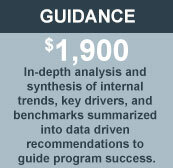 Includes Loyalty Index and Key Driver Analysis to drive continuous improvement. An additional Program Roadmap & Market Trends Report with a new set of peers - at least 3 peer programs cannot match in each report ordered. An Excel file of all quantitative results with demographic metrics grouped into categories to preserve student confidentiality while providing a data file for internal analysis. Key findings and analyst commentary presented in a concise summary. Percept Research analysts dissect your trended results compared to industry norms and your peers along with your most recent Key Driver Analysis to provide an assessment on the branding and delivery of your program. Includes questionnaire branding (school logo and naming convention), Premium Support, and survey administrator training for optimal response rates and report interpretation. The Development Fee is recurring for Alumni Surveys as they are administered every 3-5 years due to their longitudinal nature. 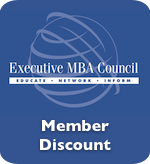 As the research partner of the Executive MBA Council and the MBA Roundtable, Percept Research is proud to offer discounts to the First Year Development Fees to members of these collaborative organizations. If your school is a member of either of these organizations, your program may qualify. 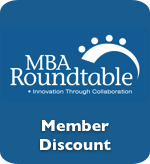 Please be sure to indicate if your school is a member institution when submitting a registration form (in the 'How to Buy' page) for each MBA Lifecycle survey.